Following on from Mistyfan’s post where she had a go at translating a number of Jinty story titles into Latin, I am going to do the same for a (smaller) number of titles. Latin is not one of my strengths though, so I will be using a modern language – namely, Brazilian Portuguese. (I was born in Brazil and speak Portuguese fluently, though it’s a long time since I have had to speak it day in and day out, so there are definite rusty patches in my vocabulary.) won’t be doing as many as Mistyfan managed, but I will be putting a little commentary behind my thought processes so that will bring something different to the proceedings. I started with “Combing Her Golden Hair“, turning it into “Pente de prata, cabelo de ouro” [literally, silver comb, golden hair]. I thought that it was important to stick to the allusive nature of the story title – it wouldn’t have been appropriate to call it something spoiler-y like “the mermaid’s daughter” or anything. Having said that, there is a song lyric which goes “Qual é o pente que te penteia” which might have possibly worked [literally, what is the comb that combs your hair? ], but the song has specific references to Black Brazilian hair types so probably not a great match. “The Human Zoo” is another nicely allusive story title in Jinty. The Portuguese for ‘zoo’ is quite long – jardim zoologico – so instead I turned it into “Somos pessoas, não animais!” [literally, we are people, not animals!]. I wonder if it might have overtones of political or racial repression rather than the animal rights references that the original story had – not that I think the original writer would have been against that sort of extension as such, but it might be a shift in meaning. It wouldn’t be a representative sample of girls’ story titles if it didn’t have an alliterative title or two somewhere in the mix. “Paula’s Puppets” and “The Disappearing Dolphin” seemed like good ones to try. If you are going to reference a girl’s name then you have to match it to the locality it’s going to be read in – Paula would be fine to use as a Brazilian girl’s name but it wouldn’t alliterate with the word for puppet [marionete] so that had to be changed. I’d initially thought of using the name Maria, which is a very normal name in Brazil, but it seemed a bit too ordinary and so I went with “As marionetes da Mônica”. Another option might perhaps have been “Mônica dos marionetes” [Monica of the puppets] but the first one might be more likely to also mean that other characters in the story are being played for puppets by Paula. “O boto que desaparece” is a very straightforward translation of the original title – it just means ‘the dolphin which disappears’. I didn’t think that this story really called for something cleverer – it’s a straightforward thriller / action story at its heart. It’s a shame to miss out on the alliteration though – not always going to be possible to transfer everything to the target language, of course! Perhaps someone whose Portuguese was less rusty would make a neater job of it. Having said that, I well remember that the popular film “Airplane” was rendered into “Fasten your seatbelts, the pilot has disappeared!” on its cinema release in Brazil – so it’s not always about a faithful adaptation, to be fair. On our pages about translations into other languages (the one on Dutch translations is the longest I think) you can see a similar range of translation choices – some are fairly literal / exact translations (Wenna the Witch / Wenna de heks), some are very similar but with choices to match the local market more closely (Kerry in the Clouds / Klaartje in de wolken), some are about as allusive as the original (The Human Zoo / Als beesten in een kooi [Like Animals in a Cage]; or another great example is Come into My Parlour (1977-78): Kom maar in mijn web [Just Come into My Web]). I find the cases where the translator has gone in quite a different direction to be almost more intriguing – did they think the original title wasn’t exciting enough? was there a risk of giving away plot twists ahead of time? 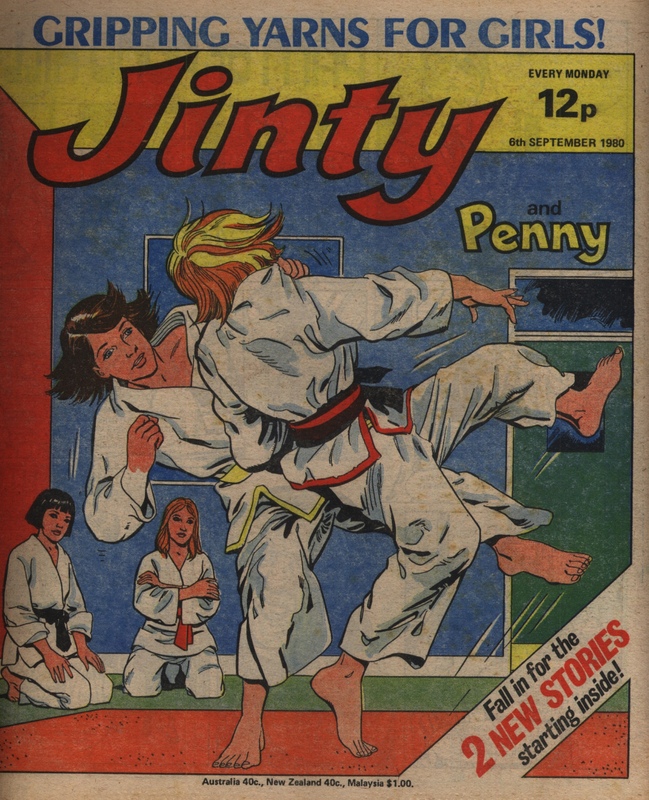 – but then it was also in keeping with some of the other off-piste titles seen in some of the girls’ comics publishing. Of this last group, I think my top pick might be the choice to turn “Gail’s Indian Necklace” into the name of the Indian deity on the necklace, Anak-Har-Li – not a very obvious choice, and one which makes the rather run-of-the-mill original title into something rather more unexpected I think. The aliens soon make it obvious that they do not care for animal welfare. They lock animals (and humans) into obedience collars that give intense pain when activated. Once the spaceship arrives on the aliens’ home planet, all the Earth specimens are sold at a cattle market. Shona and Jenny are sold to different owners, which means they are forcibly separated. The story then follows the fate of Shona, who becomes an exhibit in a zoo along with other people, and her quest to find Jenny. Shona also realises the only way to freedom is to make the aliens realise that humans are sentient beings like themselves and not mere animals. However, there is a huge communication barrier between humans and the aliens: the aliens communicate by telepathy and do not speak; humans are not telepathic and communicate verbally. A bridge between the different forms of communication needs to be found. Fortunately the zoo owner’s daughter Tamsha cares more for animal welfare than most of her people, including her father. She notices Shona and develops a soft spot for her. Although she also thinks Shona is just an animal she makes Shona her pet. Shona tries to convince Tamsha of human sentience by doing some writing. Tamsha understands it is writing but fails to grasp it is proof that humans are sentient. During this time Shona also befriends Tamsha’s other pet, a two-headed goat, which will prove a key plot development. Then Shona goes to the rescue of her fellow prisoners at the zoo, who are being forced into a cruel “chimps tea party” sideshow. This incident gives Tamsha’s father the impression she is a rogue animal and has to be destroyed. So he sells Shona to a slaughterhouse to be turned into food. Fortunately another alien spots Shona and buys her off the slaughterhouse in the nick of time. However, saving Shona from the slaughterhouse is the only good thing he does for her. He wants to incorporate Shona in a circus act that involves a huge tub of water. This is a thrilling thing for the aliens, who are terrified of water. When he tries to work the act out Shona almost drowns because she can’t swim. Tamsha’s two-headed goat saves Shona in time. The circus boss is so impressed with it all that he buys the goat in order to recreate it all as his big circus act. When the cruel act of near-drowning is performed, the aliens go crazy over it and give a huge ovation afterwards. Tamsha is the only one who is appalled. With the help of some fellow aliens who are animal rights activists, Tamsha rescues Shona and the goat from the circus and releases them into the wilderness (she thinks she is putting Shona back into the wild). The two-headed goat reunites with his own kind, and they take Shona to the Outlanders, a primitive Stone Age people who suffer dreadfully at the hands of the aliens, whom they call “The Silent Death”. She becomes very close to an Outlander girl named Likuda. The aliens remove the males, which they use as beasts of burden for farming and mining. They hunt the females for blood sport. The Outlanders are resigned to this and are also weakened by insufficient food to fight back. All of a sudden, Shona gets strange pains in her head. Then she starts having visions of Jenny, who shows her a secret valley, which is full of luscious fruit trees. Then Shona discovers the valley is real and leads the Outlanders there. Now the Outlanders worship Shona as a saviour. The pain returns and this time the visions of Jenny are horrifying. They show her being taken to a laboratory where the aliens perform experiments on her. There is also a male Outlander being used as a lab rat; he is identified as Likuda’s father, Lik. Shona and Likuda set off to rescue them. To get back to the city, they hide in one of the vehicles used by the bloodsporting aliens. En route to the city they pass a farm where they see how male Outlanders are being used as beasts of burden. It is not only cruel but also surprisingly crude and primitive for such a technologically advanced race. The Outlanders use hand ploughs and tools, while the robots that force them to work until they collapse from exhaustion use whips. Shona marvels at why the aliens don’t use machines instead; Likuda says it simpler than machines, which can break down. In the city Likuda and Shona meet up with Tamsha again. Tamsha has grown more vociferous in her animal rights activism and is part of an animal rights demonstration at the scientific establishment that is performing experiments on Jenny and Lik. The activists show they have been collecting evidence of animal cruelty, including a recording of Shona and the others arriving on the planet. The activists also remove Shona’s obedience collar. Note: this scene is deleted from the Tammy and Jinty reprint. In the reprint, when Shona and Likuda arrive in the city they just go straight into the laboratory. This deletion creates two plot holes in the reprint. First, what happened to Shona’s obedience collar? It has suddenly disappeared without explanation. Second, how come the alien scientists had Tamsha to throw into the cage with the humans? Shona and Likuda find Jenny in a bad state. Lik explains that the aliens deprived her of sleep for their experiment, which is designed to make humans telepathic so they can communicate with them. Shona realises Jenny used her new telepathic powers to tell her where she was. They are about to escape when the aliens capture them. Jenny realises too late that she had unwittingly lured them all into a trap set by the aliens. The aliens are triumphant at finally making contact with a member of the animal kingdom (yes, they still have not realised humans are sentient beings despite their experiment). They throw them all back into their cages and throw Tamsha in after them. Looks like the demonstration collapsed. Then the aliens’ weather control goes on the blink, which causes a violent thunderstorm. This is a shock for the aliens, not just because they are terrified of water but also because they have never known such weather. A lightning bolt hits the building and frees the prisoners. They make their way through the city, which is now flooding badly (looks like the aliens have no rainwater drainage systems), and sending off all the aliens into a panic. Shona spares a moment to rescue a drowning alien child. They make a boat out of a floating cupboard and sail their way out of the city. They soon find that the flooding also destroyed the robots guards at the farm and freed the Outlanders who were slaving there. When the Outlanders see Tamsha and the alien child they are all set to tear them to pieces until Shona intervenes. She tells them that the flooding has only brought momentary freedom. Once it passes the aliens will go back to their old treatment of the Outlanders. Hiding in the secret valley is no good because the aliens will find it sooner or later. She persuades them all to go and help the flood-stricken aliens, because it is the only way to be free of them permanently and live in peace. The Outlanders decide they have nothing to lose, so they put their hatred aside to begin a mission of mercy. The aliens, who have no skills in swimming, water navigation or flood control because they are so terrified of water, have been more badly stricken by the flood than Earth people would. Humans, on the other hand, have learned to swim, developed boating skills, and are more accustomed to water. The humans have a lot of success in helping the aliens, and the water is receding too. Then they find a panic-stricken engineer. Using her telepathic powers, Jenny learns that the dam at the reservoir is about to burst. If it does, the whole city will be submerged and kill everyone. The aliens are trying to redirect the water, but the crucial valve is twenty feet below water. Of course the aliens have no skills in underwater swimming. However, Likuda and Jenny do, and they succeed in turning the valve. Sadly, Likuda gets her foot caught underwater. By the time she is rescued, it is too late. Likuda has sacrificed her life for the aliens. Now, will the aliens appreciate everything the humans have done and realise humans are sentient beings, not animals? Or was it all for nothing and things will go back to what they were before? 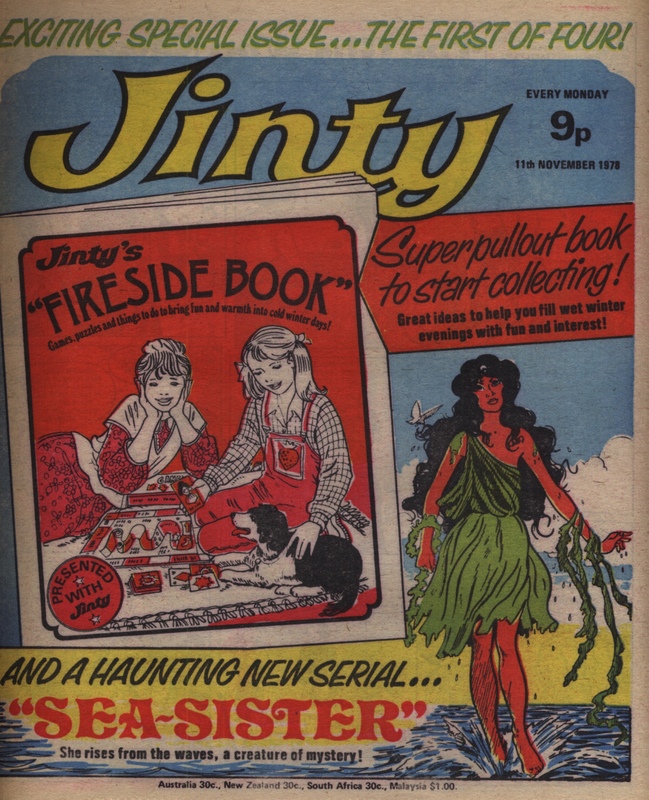 This story is one of Jinty’s classics. It is one of her most popular and enduring stories, and is right up there with “Worlds Apart” and “Land of No Tears” as one of her best science fiction stories. 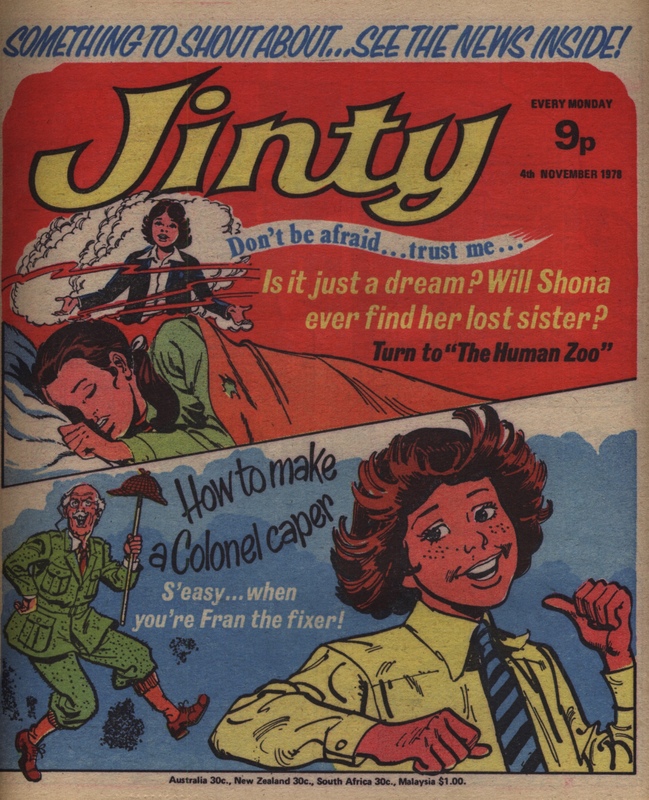 Due to popular demand “The Human Zoo” was reprinted during the Tammy & Jinty merger. No doubt a lot of the votes would have come from “Pam’s Poll” in 1980. Indeed, a panel from “The Human Zoo” featured in the poll itself. You would think such an advanced race would have more enlightened attitudes. However, it would be a mistake to assume any race that is technically advanced would be advanced in other ways as well. Moreover, it is easier to understand their coldness when we see this is a race that does not approve of soft emotions or tenderness. Sentimentality is considered as a primitive emotion and shedding tears a primitive action. After the Outlanders are freed, Tamsha is no longer ashamed to cry and tells the humans that her people have a lot to learn from them about showing emotions. Fortunately there are kinder aliens among this cold-hearted race who stand up for animal rights. The aliens clearly are light-years behind Earth in regard to animal welfare, although they are far more technologically advanced than Earth. There are evidently no laws against animal abuse and exploitation. Hopefully this will change after the humans proved themselves to the aliens and the ruler himself proposed a toast to better understanding among all species. But then, animal rights are only a comparatively recent innovation on Earth itself, and in many places on Earth they have yet to take a serious hold. Still, at least it does exist on this alien world, and without it Shona and her fellow humans would never have escaped the animal abuse they suffered at the hands of the aliens. It is ironic that an experiment meant to make contact with animals becomes the bridge of the huge communication gap between humans and aliens and helps convince the aliens that humans are sentient beings and not animals. The alien scientists did not mean it that way; they were just out to score another scientific triumph with animals. The emotional aspects of the story make it even more compelling. Shona goes through the pain of being torn away from Earth and her parents, and then from her own sister, whom she resolves to find. She is subjected to the horrors of being treated just like an animal, including a cruel circus act that takes advantage of her not having learned to swim. Even when Shona is finally freed from the abuse and joins the Outlanders she is still not safe from the aliens. Plus there is still the matter of finding her sister and maybe even returning to Earth. The story delivers quite a wallop when Likuda dies, and her death leaves an ominous question dangling over it: was Likuda’s sacrifice in vain or not? The story is a bit vague about the aliens themselves. The name of their planet is never revealed; it’s just “the planet with two suns” (binary star system). The Earth humans just call them “the aliens” and the Outlanders “The Silent Death”. What the aliens call themselves is not known. The aliens come across as rather arrogant and obtuse in assuming humans are animals and not realising they are sentient. Clearly they have not bothered with much study of the planet they have been taking specimens from. And it is implied that they have been doing so for centuries, as there is a hint they are responsible for the Mary Celeste mystery. Still, the concept is not entirely new. For example, in Star Trek: The Animated Series, there is an episode called “The Eye of the Beholder”, where Spock and Kirk are captured by the Lactrans, who think they are animals because they are primitive by their standards. (Perhaps this is the reason why the aliens think humans are animals?) The Lactrans put them in a zoo. Spock convinces the Lactrans of their sentience by mind melding with one of them and they are set free. That episode always reminds me of this story. There are some aspects of this story that don’t look like they have been all that well thought out. For example, if the aliens segregate the sexes of the Outlanders by removing the men for forced labour, then how is it the Outlander women have children? How are they able to reproduce with the men removed? Another more head-splitting example is the aliens using the time machine to restore the Earth humans to Earth the day before they disappeared. What happens when they approach the original time when the alien bounty hunters abducted them in the first place? Do they go through the whole ordeal again, come back once more with the time machine and their memories wiped, and then the whole thing starts all over again? It also seems inexplicable that the aliens even need the Outlanders to be beasts of burden in the first place. With their advanced technology they could surely come up with something more efficient for farming and mining. And this advanced race still puts out hand ploughs and hand tools for their beasts of burden to use? Oh, really! Even Earth technology, which is not as advanced as the aliens’, has advanced way beyond that in farming. Overall though, this is a very solid, powerful story that strikes a lot of chords and would leave a lasting impression on readers long after they have read it. A lot of readers would emerge from it thinking more carefully about how animals are treated. One reader wrote in to thank everyone involved for such commentary on animal cruelty and said she wouldn’t laugh at chimps’ tea parties anymore after reading the story. Some may even have considered vegetarianism after reading “The Human Zoo”.